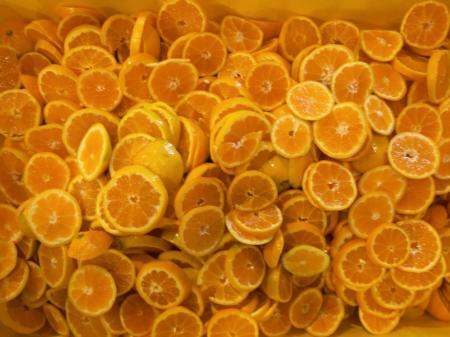 The California citrus industry is increasingly planting mandarin varieties due to the consumer demand for these ‘easy peelers’, especially the seedless varieties. Some of the insect pests appear to be attracted to and to develop better on mandarins, possibly due to their flushing patterns and dense growth. Problematic insects include citrus thrips, cottony cushion scales and aphids. Thresholds for economic damage by pests are not available for mandarins. An additional constraint for the mandarin industry is that theses fruit can not be high pressure washed to ameliorate problems of sooty mold caused by soft scales and California red scale infestations, thus tolerance for some pests will be lower than for navels and Valencias. A single variety block of mandarins being used at LREC for pesticide trials and economic threshold studies of citrus leafminer. The Asian Citrus Psyllid (ACP) threatens the citrus industry in California. Although foliar insecticide treatments can provide immediate knockdown of resident populations, their persistence can vary. In particular, new flush shoots, preferred by the ACP for feeding and reproduction, would require constant retreatment to provide consistent protection to the trees. Systemic neonicotinoids may provide more effective control of ACP on citrus. Following application to the soil for uptake through the roots, these insecticides are distributed throughout the trees via the xylem vascular system.  The insecticide then moves to different plant tissues, including the phloem where the ACP feeds. The target threshold for imidacloprid required for ACP control has been estimated at between 200-250 ppb. In this study, we will evaluate the impact of irrigation on the uptake of imidacloprid applied at 2 rates. Our objective is to determine the irrigation conditions that will promote optimal uptake of the insecticide from the soil to ensure that effective concentrations are reached that will protect the trees from ACP feeding. A variety trial of eight mandarins, six satsumas and two other types was established by Dr. Chao at Lindcove in 2003. The purpose of this trial is to evaluate these new releases for tree and fruit characteristics in order to formulate recommendations on their use by the California citrus industry. Each cultivar is budded on four commonly used rootstocks, Carrizo, C35, Rich 16-6 trifoliate and Rubidoux trifoliate, so the trial also tests compatibility issues. 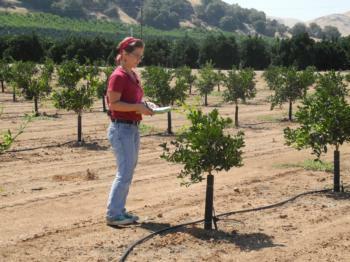 We collect data on tree size, tree health, yield, and fruit quality. Trees of cold hardy mandarin varieties will be planted at several small mixed farms in Humboldt County in the inland valleys where peaches, grapes and kiwi are currently successful. Olives are also being planted as a new crop. Growers are interested in exploring diversification and have started to plant mandarin varieties. The Farm Advisor is interested in cold hardy citrus varieties to be able to make science-based recommendations and in maintaining citrus germplasm in isolated areas far from disease sources. 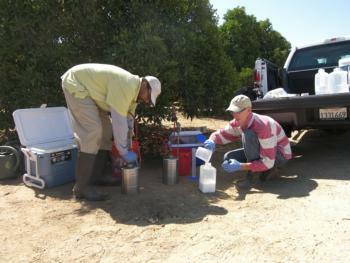 Determine the persistence of pathogen surrogates on citrus fruit, predominantly navel oranges, during the California harvest season at the UC Lindcove Research and Extension Center (LREC) experimental orchards. The primary immediate goal is to develop risk assessment information for survival post-contamination in pre-harvest phases under open environment conditions to assist in current dialogue with the USFDA during produce safety rule-making.